For a few years, Archinect has been collecting anonymous salary, satisfaction, and other juicy job-related data through its Architecture Salary Poll. 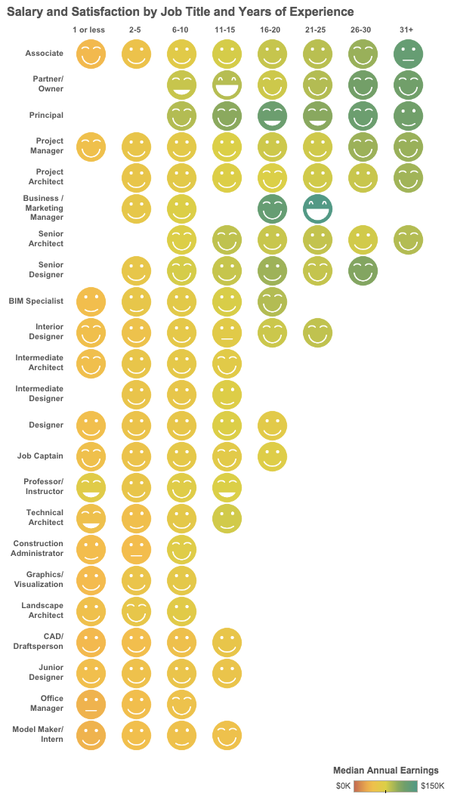 It's a great resource--a Glassdoor for the architecture world--and Archinect has shared this dataset with ACSA in order for us to conduct some visualization and analysis. 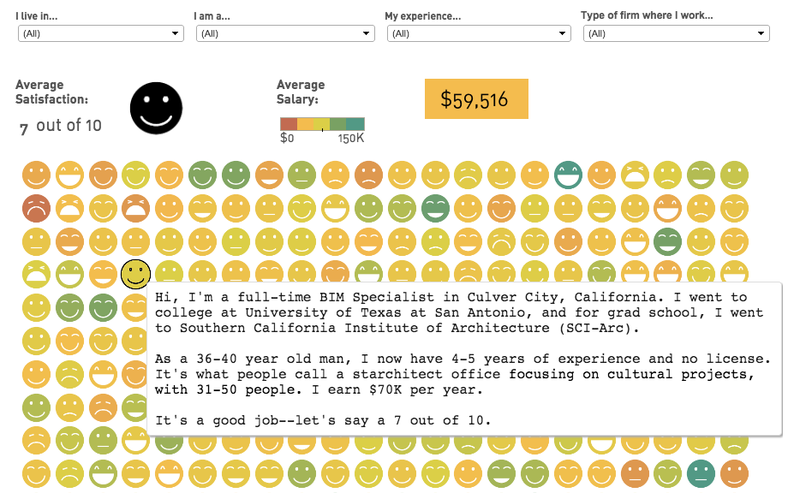 We've created an interface where you can explore people's career stories visually. Green faces are higher earners, red faces are low earners. You can see if people are happy or sad, and mouse over to get all the details. Filter the results to hone in on the people you want to hear from. At this same page on ACSA's website, there are a few more charts that compare salary and satisfaction to years of experience. 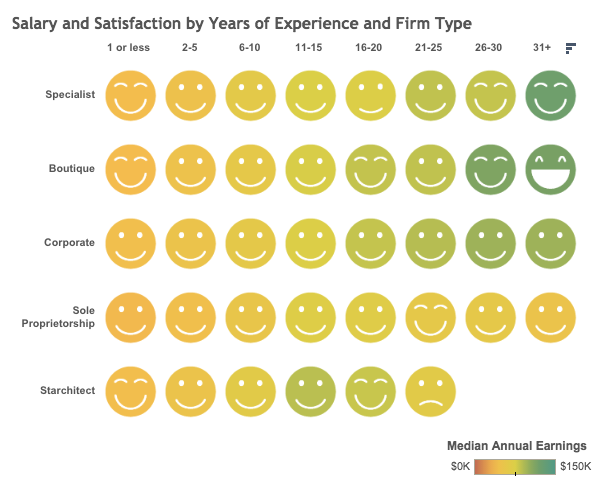 For example, this one compares the median (middle) earnings and satisfaction for people at corporate, boutique, starchitect, specialist, and sole proprietor firms. We also compared earnings and satisfaction by job title. The other interactive piece sorts the faces in any given group by gender, so you can see how men and women are doing, at a glance. In future weeks we'll be taking a more analytical look at this data to summarize patterns and trends. But since a major strength of this dataset is the level of detail about individual people and their trajectories, we wanted to start with a focus on those narratives. Check it out! Let us know what you think, below. And be sure to submit your salary data to Archinect's poll. It's anonymous and will help us build this resource. If you're looking for more salary-related resources, check out the 2013 AIA Compensation Report, DesignIntelligence's Compensation Survey, this slide from the ACSA Atlas, and this interactive visualizing data from the Bureau of Labor Statistics. A recent M.Arch graduate had a background in accounting and get's hired right out of his graduate school program as a Project Manager at a large corporate office. His salary is then reported at $70,000. Meanwhile, a B.Arch student who just graduated from college with 1 year or less of experience gets hired at $45-$48k per year. The above report is not helpful at all in understanding what the difference is between the person who has 1 year or less of experience and gets hired at +/- $70k per year and a person who has 1 year or less of experience who get hired at +/0 $45k per year. Lastly, it would be helpful to eliminate information on all foreign candidates who report their experience based on their U.S. experience. There may be architects who are licensed outside of the U.S. who's status as licensed architects earns them a better wage. Everyone wants a better wage.. let's try to get these statistics to provide some insight to people on what they need to work on in order to get the wage they want/deserve. Bulgar is on the dot. Firstly, undergraduate degrees should be reported with a bit more specificity. Secondly, a small narrative would be worthwhile. Finally, the ranges are too broad. Anecdotally, there's a huge jump in between 4, 5, 6, and 7 years of experience. Clustering experience levels instead of actually setting a drop down with the numbers one through 30+ would be adequate enough of a fix. 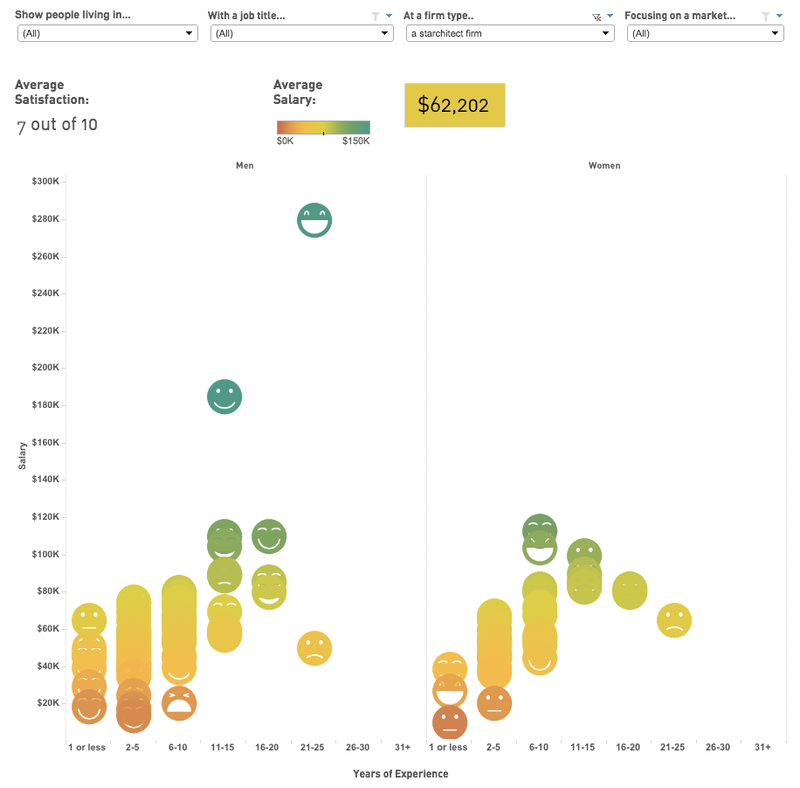 We're discussing Lian's work visualizing our data, and our salary poll in general, in this week's Archinect Sessions podcast. Watch out for that release on Thursday. The salary poll is due for an update, so if anyone else has any ideas to propose, for how to improve it, share it here and we'll take it into consideration, or even discuss your idea on the show if you post it in the next couple hours. Null pointer, we're also publishing more analytic charts in the next release. So in terms of comparing salaries at different experience levels, we'll definitely be doing that, so stay tuned! I think integrate Lian's suggestion on debt from his post somewhere else I saw in archinect....probably the debt piece..........one obvious pattern based on the above - the longer you are in the field the more money you make and the happier you are, except employees of starchitects........... I would want to know how this initial dissatisfaction with the profession relates to other professionals and then if possible determine if this has to do with academia not preparing the future architect for the real world. This may just happen in all jobs, you study one thing and have dreams and then you get a job and it's not what was expected......this relationship to other jobs would be interesting to me. Chris Teeter, good suggestions, thanks! Yes, we found a sagging curve for satisfaction (happiest at the lowest and highest levels of experience, less happy in the middle years), and I also wondered if that's just human nature or something specific to architecture.